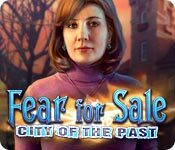 Fear for Sale: City of the Past is rated 3.8 out of 5 by 11. Rated 5 out of 5 by SparkleGlow100 from LOTS of PUZZLES! More HOPS than usual too! The main game is good and I enjoyed it! There are LOTS of yummy puzzles, I could do all of them, and didn’t have to skip any: sliding bars to allow one to get through to the other side (my favorite), getting colors grouped around circles, fitting shapes in an area and more. They weren’t super easy or super hard. Lots of HOPS too! I think the SE is a good choice. I did like the morphing objects in the CE, but the bonus game was nothing special. Rated 5 out of 5 by kateblue222 from CE or SE? Great game, but lacks some CE features, so SE might be a better buy. I write the recommend whether to buy the CE or the SE because that is what I want to know if both are out and I have bought neither. I'm playing the 4th chapter now, so I am over halfway through. The game is still as much fun as it was during the demo. Some reasons to buy the CE are: -A bonus chapter which I cannot advise about because I have not gotten that far yet. -Replayable music that I actually might listen to outside the game. -Achievements and collectables, but I mostly don't pay attention to those so I cannot advise. -A map which also tells you if there is a collectable object at a location, a feature I have not noticed in other games. As I said in my CE review, there's no ability to play the great HOPs and puzzles over again. Usually, I will grade a game down for that and not buy the CE. But I bought the CE because I was having so much fun playing that I couldn't wait to buy. That doesn't happen often You don't have that problem, though; you can just buy the SE. And you should if you don't buy the CE. It's my favorite game. Go, go! Why are you still reading? Everything is two-for-one today! Rated 5 out of 5 by biscuitsmama from WHO KILLED EVELYN ROGERS? 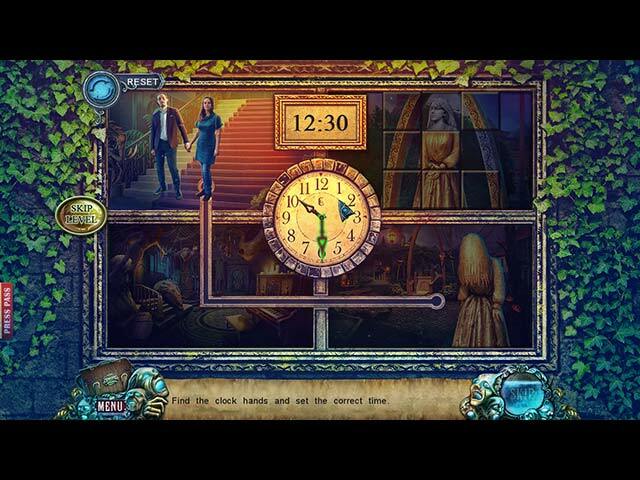 In this terrific new Fear for Sale game your expertise has once again been called upon to solve a paranormal mystery. Some very strange things are taking place in the town of Eastwood where statues are coming to life and harassing people. This strange phenomenon began when the sculptor Evelyn Rogers died in a fire that was blamed on her young friend and model – Amelia Jones. Evelyn’s husband is behind the theory that the fire was arson and that it was caused by Amelia after she was caught stealing jewelry from Evelyn. Could it possibly be that there is a different murderer and that the reason for Evelyn’s death was more sinister? You will have to play City of the Past to find all the answers. The game offers four modes of gameplay including the Custom mode where you can fiddle with the settings to play the game the way you want. The graphics are a bit foggy in the opening scenes but improve considerably once Emma arrives in Eastwood to start her investigation. The voiceovers are excellent with the exception of Steve’s very slow voice as the game begins. Your tools include an interactive map that you acquire early in the game. The thing I like about the maps in this devs games is that they show where we have found all of the collectibles or where some might be missing. I have always appreciated that nice touch and find it quite helpful when I am trying to find every collectible and morphing object. The game comes to us from one of my very favorite devs who has created another series that I really love. One of the things that I enjoy most about their games is that their HOP scenes are excellent and have since been emulated by other devs. If you have played their other games you will know what to expect. The HOPS are not overly interactive but some items can be tricky to figure out. For the most part, the scenes are list type but there is certainly some variety as well. The puzzles are not difficult, even the first multi-tiered puzzle was doable. Being very familiar with this dev’s games, I do know that the puzzles vary in difficulty and some will be challenging. Extras in the CE version of the game include several sets of collectibles and morphing objects to find. Of course there are achievements to earn as well. The remaining extras are fairly standard and include the Strategy guide, Bonus Chapter or Game, Wallpapers, Concept Art, Screensavers, and Music, Movies, Games, Puzzles, Artwork. IMHO this is a great CE package and worth the extra cost. Although the Fear for Sale series started out to be excellent, I didn’t care for the last game nearly as much as I did the others. I am happy to say that City of the Past has restored my interest in the series and has proven to be an excellent game. I purchased the game as soon as it was available and I am very happy that I did. Even though the storyline might be a bit predictable in its outcome, getting there is half the fun. I love the gameplay and even though it is not overly challenging, it is entertaining and quite a bit of fun. I recommend that you at least try the demo to see if this is a game you will enjoy as well. 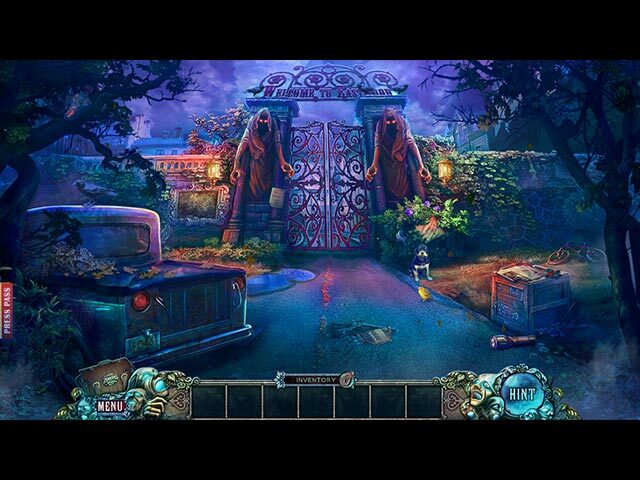 Rated 4 out of 5 by deddu from Fear for Sale Good interactive hidden objects game, or you can switch to puzzles. There is a very responsive hint button, a task list and map. The mini-games are not hard. There is, however, "loading" between every scene which does slow down the play. Rated 4 out of 5 by pennmom36 from Fearful Talents Artist Evelyn Rogers, died in a horrible fire, but, was it an accident? The entire town of Eastwood pointed their finger at Amelia Jones who was the prime suspect, after all her drawings depicted and correctly predicted Evelyn's demise! Something's very wrong with this town's logic, and when Evelyn's sculptures come to life, Emma Roberts is called to Eastwood to investigate this paranormal phenomenon for the Fear For Sale Magazine. Are the spirits of the innocent trying to right the wrongs happening in this tiny town? Does Amelia Jones have the unique ability to see into the future and draw predictions of what was to come, or are they blueprints of the inevitable? This game has a unique feature where you earn points every time you find items which not only helps you gain journalistic experience (8 different promotions starting with Cub Reporter) but you can also challenge a friend to beat your score. There are several complex inventory items that require some type of interaction before the item can be used, and the Collector's Edition has plenty of Achievements to earn, 35 Beyond Objects and 5 different Collectibles in each of the 5 different categories, Eastwood Postcards, Clay Ocarinas, Toys, Actress Things, and Doctor's Equipment. 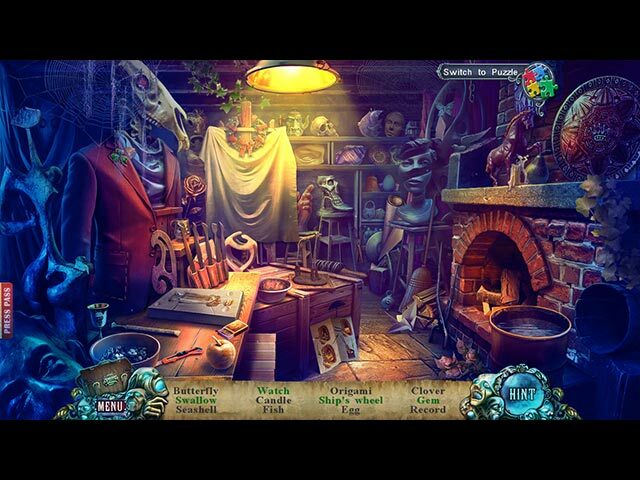 The Hidden Object Scenes are mostly interactive list finds, but some of them have steps to achieve before exposing the list such as finding multiples of one item or finding and placing items into their matching silhouetted shapes. There are also Zoom Zone puzzles where you find 6 different items strewn about the room. There is an optional Jigsaw Puzzle to play instead of the HOP. The Mini Games are decent, but nothing really new or spectacular. Below is a brief description of some of the games you will encounter so skip this section if you don't want a spoiler: 1) Find missing objects and place them correctly. 2) Restore an image by placing round tokens, some of which are blocked requiring you to use arrows to switch tokens. 3) Lead a figurine to the green zone using obstacles as bumpers. 4) Interact with several different puzzles on a puzzle board to find the correct solutions. The Collector's Edition has: 9 Wallpapers, 11 Concept Art Pictures, 3 Screensavers, 13 Music Soundtracks, 25 Collectibles, 35 Beyond Objects, a built in Strategy Guide and a Bonus Chapter, enjoy! Rated 3 out of 5 by coffeyfan77 from Statues of Limitations It's time for another installment of Fear for Sale, where you play as a journalist investigating odd goings-on in a small town. In short, the statues have come alive for some reason and are attacking townspeople. Naturally that doesn't stop you. The big positive for HO fans like me is that there are plenty of them, including multiple times at the same location. Unfortunately they aren't very tough and that's a common theme for the game. Voice acting was fine but nothing special. Graphics were underwhelming overall to me, even during cutscenes. The mystery element of the game was fine, but you'll see what happens coming from almost the very beginning. There's just not enough characters here, and they all fall into the standard tropes. Minigames are varied but not challenging. I will give the developers credit that they made the game pretty creepy, and allowed for plenty of mouse clicking exploration with fun results. As for the end of the game, it's tacked on to a degree that feels phony. It's like every bad movie ending you've ever seen. While the gameplay was fun and nothing was outright bad, I found this entry limited and it leaves me wondering if this franchise has reached its expiration date. Rated 3 out of 5 by mele091954 from Fear For Sale I felt that this would be a good for teenagers and adults to play. The visual for looking for objects was challenging and fun. Rated 2 out of 5 by emollie26 from A real head-doer! Approx. 1hr of S.E. played. Then uninstalled. Easy game. Lockable inventory. Didn't come across any glitches. Graphics o.k. To skip puzzles, I had to wait for them to play out. Boring! Thank goodness, for the transportable map. Find item, take it here, then go over there & pick something up. Backward, & forward, repeat, repeat, then do it all again. Wasted too much time clicking on map, I couldn't get into the game, so, did not flow well. I wonder how much time, was added to the game, doing all this back & forward time-wasting stuff? Hmmm! Just as bad, H.O.s were visited twice. A definite no-no, for me. This is just my opinion. Others will love it, so enjoy.